More and more construction projects have broken ground in China over the past few years, with billions of dollars being poured into their budgets. Are they worth such huge investments? People have different opinions on the matter. The following are the top 10 over-priced buildings in China. Located at an end of Nanjing Road Pedestrian Street in downtown Shanghai, Shimao International Plaza is a 60-floor skyscraper and the tallest building in Puxi District. The building was completed in 2005 and designed by Germany's Ingenhoven, Overdiek und Partner and East China Architecture and Design Institute. The plaza has two spires on its top, making its total construction height 333.3 meters. 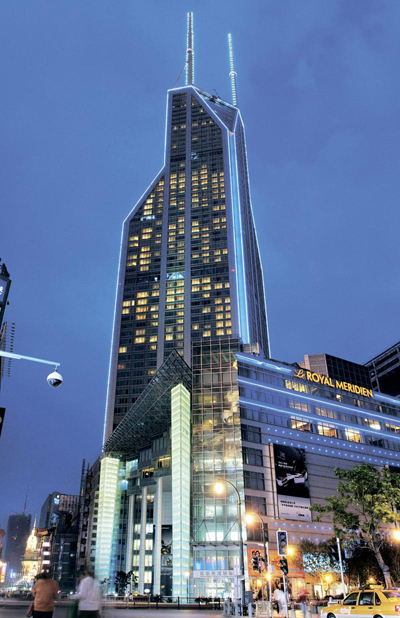 The upper floors (11th-60th) house the five-star, ultra-luxurious Le Royal Méridien Shanghai hotel with 770 rooms. The building also includes a large shopping mall, restaurants and exclusive clubs. More and more construction projects have broken ground in China over the past few years, with billions of dollars being poured into their budgets.